Donald Trump Jr. cited attorney-client privilege as the reason he refused to answer lawmakers’ questions about a meeting he had with his father, President Donald Trump. Legal experts say that’s not how attorney-client privilege works. Donald Trump Jr. invoked attorney-client privilege during his testimony before the House Intelligence Committee on Wednesday, arguing that because lawyers were present during one of his meetings with his father, President Donald Trump, he could refuse to answer lawmakers’ questions about their conversation. The conversation between Trump Jr. and his father was about a meeting Trump Jr. had at Trump Tower in June 2016 with a Russian lawyerto get “dirt” on Hillary Clinton. 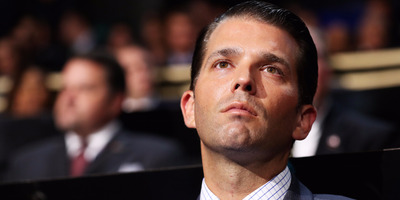 Trump Jr. spoke with his father shortly after the news about the meeting broke in July 2017, but declined to share details of their discussion with lawmakers. Lawmakers and legal experts immediately derided Trump Jr.’s invocation of attorney-client privilege, noting on social media and in news outlets that the mere presence of a lawyer does not make a conversation protected. Rep. Adam Schiff of California, the ranking Democrat on the House Intelligence Committee, told The Washington Post he’ll issue a subpoena if Trump Jr.’s lawyers continue to pursue his claim of attorney-client privilege. In the meantime, Schiff said, the lawyers have asked for more time to decide how to handle the claim. Renato Mariotti, a former federal prosecutor, said on Twitter that he doubted any court would conclude Trump Jr.’s conversation with his father was protected.